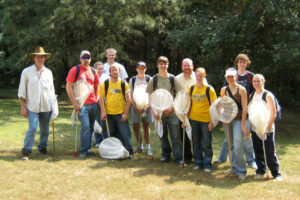 An entomology course visits the Arboretum for an afternoon lab session adding to their collections. A variety of courses make use of the Arboretum’s resources, and as our mission states, we invite all areas of study to find new and creative ways to make use of all that Starhill Forest has to offer. The Arboretum is open to collaborations with faculty and students from all disciplines. Biology and Environmental Science courses regularly spend lab sessions collecting specimens, conducting research on site, or utilizing our collections and data. The Arts and Literature might take inspiration from the gardens and the ever-changing natural landscape or use the grounds for an outdoor performance space. Education students might explore ways to bring nature into their classrooms. Those studying psychology or sociology might investigate the mental, physical and social benefits of spending time in nature. Think outside the box! Don’t hesitate to contact us with your ideas. 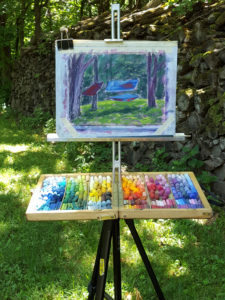 The local Pastel Society takes advantage of the peaceful natural setting to create en plein air. If you’re looking to learn a thing or two about oaks, native plants, gardening, forest management, Starhill’s cultivars, or any number of topics relating to the natural world and the Arboretum’s mission, Starhill staff can lead a hike or plan an activity to suit your group. Contact us for more information. Whether as an individual or a group, volunteers from the campus community are welcome at the arboretum any time of year. There is always work to be done, with diverse skills and knowledge to be gained from an experience working at the Arboretum. Assist with invasive species removal, trail clean up, planting and potting, preparing for the native plant sale, and much more! Want to take your experience a step further? Consider one of our paid summer internships! The arboretum is an ideal location for social gatherings for student organizations, athletic teams, and departmental retreats. If you’re looking to unplug and enjoy nature, all are welcome to hike the trails, relax in the hammocks, plan a picnic, sit around the campfire, and enjoy the sights and sounds of the arboretum. Bring your tents and consider a forest campsite near a riffle on Rock Creek. With the field lab close by, there is access to restrooms and other amenities. If there is work to be done, the Arboretum can provide meeting space. The field lab is a great venue for small retreats, meetings, and classes. Hardware provided by the college has greatly improved wireless internet access. A projector, screen, whiteboard, kitchenette, restroom, seating, and more are available to accommodate your needs.